Two channels running North to South and two running East to West divide this garden into a grid of squares. There are six lotus shaped fountains at the crossings of these channels. Wheresas the energetic fountains rising upto a height of 12 feet create soothing murmur that enthralls the visitor, the channels are so tranquil in their movement that they seem frozen. In the channels at appropriate times of day can be seen reflections of the imposing building and the proud flowers. There are wooden trays placed on stands in the centre of the channels where grain is put for the birds to feed upon. 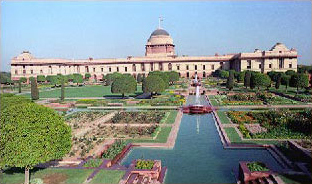 There are two big lawns, the central one is a square with each side being 45 meters and the East lawn adjacent to the building, oblong in shape and about three fourth the size of Central lawn. The lawns are covered by 'Doob' grass which was originally brought from Belvedere Estate, Calcutta when they were initially laid. The entire turf of the lawn is removed once in a year before the monsoons, new top soil is spread and it takes three weeks for the grass to grow again. In the evenings Peacock with their consorts can be seen leisurely moving around. And once in a while a lapwing can be seen meditating oblivious of the surrounding splendour. Then there are Spotbiils (Resident ducks of Delhi Region) who have made a home of the channels and the garden. They are often seen enjoying a family picnic what with gardeneres in attendance with bread rmbs and choicest greens for their repast. And then there are parrots, mynahs, dovesm piegons who bath and bask with an ease of manner that evokes envy and admiration in all onlookers. Few lucky ones have also spotted birds like cormorant, jay or a transiting stork. This garden derives it's evergreen texture from Moulsri, Putranjiva Roxburgi, Cypress, Thuja Orientalis and China Orange trees, rose shrubs and a variety of climbers. Moulsri or Bakul is a typically Indian tree. Planted in the square patches of lawns along the channels and on the periphery of the two main lawns, they are pruned to look like mushrooms. They provide character and depth to the garden. They flower in the months of May and June and their mild sweet fragrance saturates the surroundings. This tree has been mentioned in the 'Sangam' literature, in the plays of the great poet Kalidasa and more recently by Abul Fazl in Ain-in-Akbari. There is an interesting details of this tree in a play by Kalidasa. The tree about to bear flowers is compared to a pregnant woman who nurtures desires for unusual things. Thus during the budding period the tree was said to have a desire to be sprinkled with mouthfuls of liquor by a virtuous maiden. This privilege was reserved for the queens and the princesses and celebrated in a royal ceremony. Cypresses line the pavement and give a touch of formality, by virtue of their unchanging, full, erect shape. Planted axially they provide a perspective of depth. China Oranges alternate with Cypresses, and provide a welcome break from monotony. Whereas Cypress symbolises death and afterlife the China Oranges change their appearance through various stages of growth from season to season, symbolising renewal and celebration of life. Putranjiva Roxburgi are planted around the two gazebos located at the western ends of the two terrace gardens. Not more than a skeletal structure of stone beams these gazebos are unique by themselves and in combination with the shade of Putrnajiva Roxburgi create an inviting grove of peace and repose. Thuja Orientalis, a coniferous tree ornately hemmed in squares of well chiselled hedges of Golden Duranta presents a marvellous spectacle. This combination is placed along the periphery of the main garden and marks the various intersections and terminations in the pattern. Roses flower throughout the year. The prime bloom though is after they are pruned in October every year. Along with the evergreens mentioned so far, roses help in achieving the permanence in texture throughout the year. The garden has more than 250 celebrated varieties of roses, which makes it one of the best Rose Gardens in the world. It has roses like Bonne Nuit, Oklahoma which are neares to being black. In blues it has Paradise, Blue Moon, Lady X. We also have the rare green rose. The Roses ahve some very interesting names. Few Indians that have found place here are Mother Teresa, Arjun, Bhim, Raja Ram Mohun Roy, Jawahar, Dr.B.P.Pal. The international celebrities here are John F.Kennedy, Queen Elizabeth, Mr.Lincoln, Montezuma. Others worth mentioning are Christian Diar, Happiness, Century Two, First Prize, Jantar Mantar, Peter Frankenfeld, American Heritage, Bejazzo, Iceberg, Granada, World Rose, Command Performance, Imperator. The list is endless and the spectacle delightful. Various herbaceous annuals and biennuals are grown in beds and informal borders. The beds are sited at the edge of lawns or along the pavements. Also the floweres are massed irregularly with respect to their height and grouped in colour combinations to produce harmonious, natural and pleasing effect. 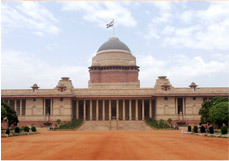 The planting of seasonals is done twice a year in preparation for the "At Homes" hosted by the President on the occassion of the Republic Day( 26TH January) and the Independence Day(15TH August) every year, which are hosted in the Central lawn. For winters the garden is replete with a number of annuals that have to compete with each other to find a place. Dwarf annuals like Calendula, Antirrhinum, Alyssum, Dimorphotheca, Eschscholzia (Californian Poppy), Larkspur, Gaznia, Gerbera, Godetia, Linaria, Mesembryanthemum, Portulaca, Brachycome, Metucharia, Verbena, Viola, Pansy, Stock grow well in flower beds. Other annuals that are grown include Dahlia, Aster, Carnation, Chrysamthemum, Clarkia, Statice, Lupin, Marigold, Nicotinia, Nemesia, Bells of Ireland, Poppy, Stock, Salvia, Cosmos, Linum, Sweet Sultan, Sweet Pea, Cineraria, Sweet William etc. They are used in pure beds and in combinations of varying heights create a pyramid of colours. Edging and bordering of flower beds is done by Alyssum, Phlox, Petunia, Dasy, Pansy, Mimulus etc. Under the standard roses are grown Daisies, Mesembryanthemum, Pansies, Viola etc. Naturalizing effect is created by the bulbous flowering plants like Narcissus, Freesia, Zephyranthrus, Gladiola, Tuberos, Oriental Lily, Asiatic Lily, Tulips, Anemone, Ranunculus, Iris, Daffodils etc.